THIS website contains almost 50,000 words and even if we had devoted them all to the subject of the environment then we would still only just be scratching the surface of this very important and complex issue. Locally we can make a difference if the choices we are given are improved, enabling green to move from being fashionable to becoming a way of life. Environmental issues were almost forgotten a couple of generations ago as people in the 1960s thought that with clean air acts and control of sewage the matter was well in hand. It was only after books such as environmentalist Rachel Carson’s Silent Spring and economist E J Mishan with ‘The Costs of Economic Growth’ put doubts into some people’s minds that the goal of ever increasing output was questioned. Later along comes Fairtrade, the ozone hole and CO2 inspired global warming to put Green issues at the top of the agenda - or they were until the banking crisis. Even all with the evidence on the table there are some people, a number of them well read and intelligent, who fail to accept the link between human activity and the impending climatic catastrophe. We believe that the link has been proved beyond reasonable doubt. We also accept that there are arguments that could be powerful to some which may suggest that it has only been proved on the lesser test of ‘on the balance of probability‘. What we would say to them would be are you prepared to risk the earth gambling that your minority view may be correct? Hopefully they will say no because the stakes are just too high. Another argument is that it doesn’t matter what we in the UK or Warminster do as we are such a small polluter in comparison to other nations. Now that President Obama is in power we will never have a better time to take action and take a lead role. So what can we do locally? We can try to ensure that everyone is offered the opportunity to adopt a more environmentally friendly lifestyle and that they feel better and are better off though doing it. Homes need to be properly insulated, work needs to be near to home, travel to work needs to be easyand sensibly priced, and people need to be rewarded for taking the green option. Community leaders should set an example. We tried to find out how much councillors in Wiltshire get paid for travelling in their cars but such information isn’t easy to find on their website - are they embarrassed about it? Hampshire councillors receive 53.8p a mile so Wiltshire won’t be much different. The rate should be halved and those councillors who live on a direct rail line to Trowbridge should be expected to catch the train, as County Hall is only a short walk from the station. Visionforwarminster candidates fortunate enough to gain election to the new council will pledge not to claim mileage for travel to meetings at County Hall but will travel there by train or bike instead. This is a token gesture, of course, but it shows that we mean business on this issue. To be fair Wiltshire County Council has had a better than average record on many fronts. It is one of the biggest subsidisers of bus services and the county’s waste contractors Hills says that more than 108,000 metric tons of waste was diverted away from landfill in 2007-08 giving the county a recycling rate of almost 39 per cent. The system of kerbside black boxes seems to work well but we must look for a way to ensure cardboard and plastic is also re-cycled. Achieving everything we want won’t be easy as the price of recycled raw materials fluctuates wildly from year to year making planning and investment difficult. The one sure constant however, is that landfill space is filling up and will get ever more expensive to use. The new Wiltshire Council will also have the job of knitting together a patchwork of slightly different collection systems inherited from the district councils. Wheelie bins, for example, were introduced in West Wiltshire in 1987 but didn’t arrive in Kennet or Salisbury Districts until 20 years later. Another issue is green waste and we would propose that the public participate fully in the future direction that is taken with this issue. We would ask whether it is environmentally friendly to send huge freighter lorries miles out to places such as Kingston Deverill or Codford to collect green waste. 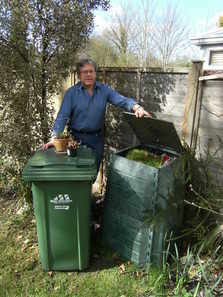 Most of the properties in such places have large enough gardens to accommodate composters. We would suggest that the green waste collections be stopped in all the villages and that every rural household be given a free composter as compensation. Those of us who were brought up in the countryside can hardly believe that the suburbanites who have invaded many of our villages actually want green waste collected in any case. Have they never heard of a compost heap? That leaves the problem of green waste in towns. The service that was introduced into West Wiltshire, and is operational in Warminster, is an expensive joke which is hardly used and expensive to run following the decision to disallow cardboard in the big green bins. It is also extremely regressive in that it is charged to all through the council tax (even those in flats with no gardens) yet tends to be used by the wealthier members of society who have larger gardens. It is a bit like the council organising and paying for garden parties but only inviting those living in band D homes or above to come along. The provision of a green waste collection service is in effect the poor subsidising the rich, albeit by a small figure of probably no more than £10 per household per year. Why should poor people with small or no garden subsidise rich people with big gardens by contributing to a green waste collection service through their council tax? Is it really green to send huge lorries around every street every fortnight to collect material which would be better left in garden composters or compost heaps? Composting is by far the most environmentally friendly way of dealing with green waste but it does not count towards recycling targets if dealt with in this way - which is wrong. Last year Hills say they collected more than 16,000 metric tons of kerbside green waste of which 1,100 had to be rejected on quality grounds. Some of this is composted and sold back to people via household waste recycling centres - which people use their cars to collect. 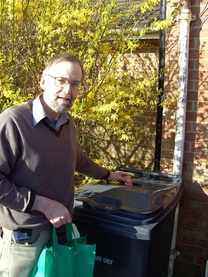 (Pictured - Steve with his rear garden composter which he says has rendered his green bin totally redundant. Paul also has a composter in his rear garden). People who enjoy swimming have to pay to swim although it is an activity subsidised by the council. We believe it is a fair, equitable and progressive measure to make a small annual charge on those who wish to use the green waste service. We then come to the issue of fortnightly collection. The decision to change from weekly to fortnightly collection was widely condemned and it would be easy to make cheap political capital by promising to return to that system. But we believe in democracy and that people should be given at some point in the future the option of voting on this matter in the full knowledge that returning to weekly collection will add X pounds to council taxes. The disadvantages of fortnightly collection are that, especially, in poorer neighbourhoods, it causes some public health concerns. Bins may not all have lids, bins can be overloaded so that lids are open which enables flies to gain access to rotting carcasses resulting in maggots, smells and rats. Where bins are stored close to open windows, because of lack of storage space, this causes unacceptable problems for many. If the council retains fortnightly collection then it must also provide a rat control service free to all who need it. It is perfectly possible, unless people in your household have special needs, for a family of four to reduce their rubbish to one bin a fortnight, but it takes effort. We should reduce the amount of effort required by improving the availability of cardboard and plastic recycling points in towns. The advantage of fortnightly collection is that the system cuts costs by a significant amount and also tends to increase recycling rates as it forces people to take more note of what they throw away. It is not popular with the public however. Would you like to see weekly collection of waste reinstated ? We want the council to continue with its policies but to inform and educate the public as to why they are required. We have already mentioned the Warminster Rubbish Awareness Project initiative in our piece on Civic Pride but would use the WRAP to target the issue by getting the message across at schools -hopefully the children will nag their parents into a greener future. The green issue is a massive one and we could also have talked at length about the need to provide bus shelters around the town, more ways of encouraging cycling and car-sharing and the need to provide Warminster with more allotment land (this encourages people to eat seasonal foods). The council's decision to enhance Warminster Market Place by narrowing the carriageways has effectively killed off cycling through this area because of safety concerns. We are interested in hearing your ideas and particularly want you to take part in the polls on this page. They are totally anonymous and risk-free and we know that what is being written on these pages is being closely scrutinised in Trowbridge as this site is unique. Promoted and published by Steve Dancey of 21 Newport, Warminster, and Paul Macdonald, of 144 Boreham Field, Warminster.